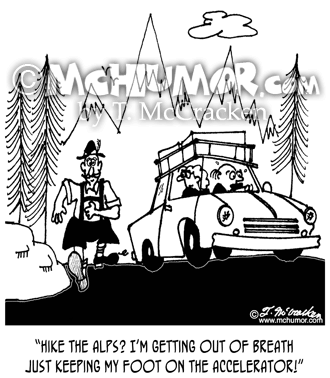 Europe Cartoon 3281: A man driving in the mountains behind a hiker saying, "Hike the Alps? I'm getting out of breath just keeping my foot on the accelerator!" 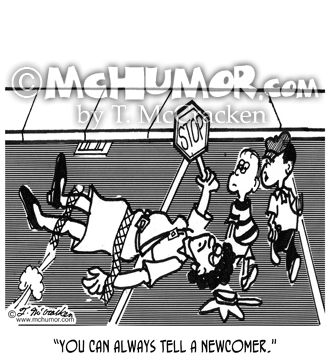 Crossing Guard Cartoon 2163: A kid looking at a school crossing guard who's been run over says, "You can always tell a newcomer." 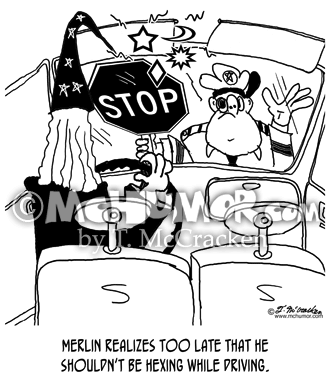 Magician Cartoon 8646: "Merlin realizes too late that he shouldn't be hexing while driving." A wizard driving runs into a crossing guard. 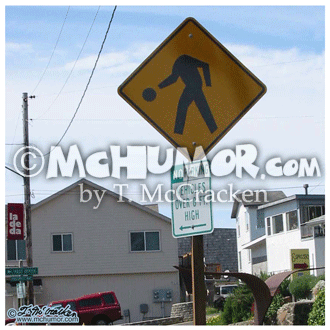 Pedestrian Cartoon 8002: A pedestrian crossing sign has a headless pedestrian chasing his head that's fallen off. 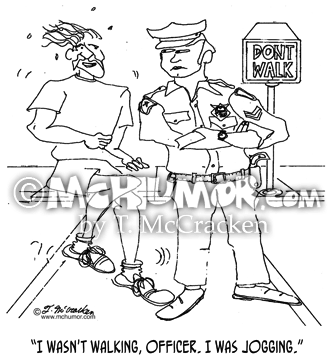 Jogging Cartoon 0865: Jogger stopped by cop in front of a "Don't walk" light says, "I wasn't walking, officer. 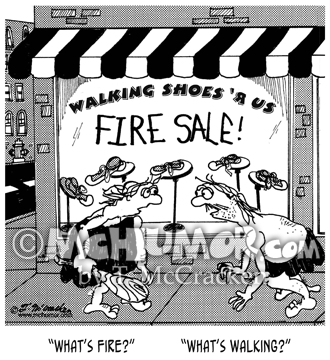 I was jogging." 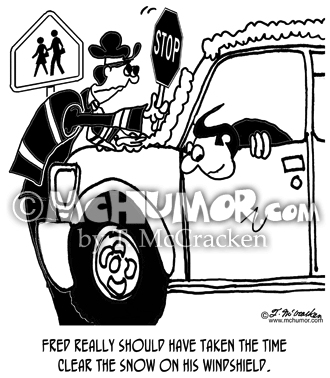 Driving Cartoon 8386: "Fred really should have taken the time clear the snow on his windshield." 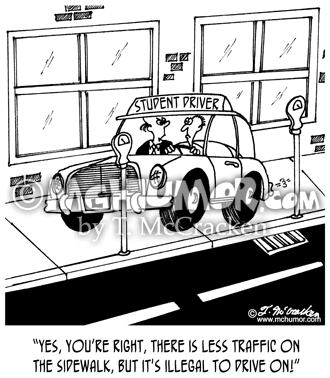 A man in a car covered in snow sticks his head out the window doesn't see that he's run into a school crossing guard. 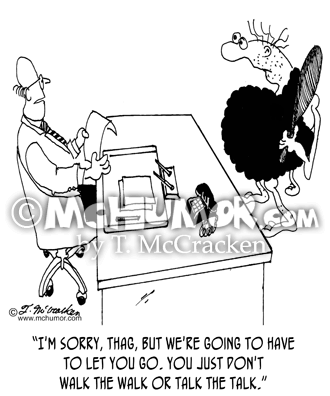 Evolution Cartoon 1986: "The evolution and de-evolution of man." 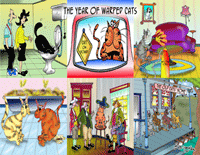 Multi-panels. 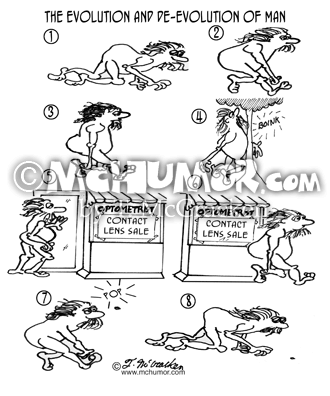 A man crawling, he stands and walks, he walks into a tree, he walks into an optometrist's office having a sale on contact lenses, he walks out, his contact pops out, he's back crawling looking for it.